December 16, 2010 – For the past couple of weeks, I’ve been gradually getting ticked that the entire U.S. is getting snow except for my area of New England. Snow is one of the reasons I moved to the region in the first place, and I kind of feel like New England is currently in breach of contract with me. I'm screaming for a white Christmas. Last night I figured that even if there's no snow on the ground, I can at least have snow on my television screen, so I watched a movie that heavily featured snow in its story. I could have chosen any Christmas movie, I guess, or John Carpenter's The Thing, but I ended up plucking the Rankin-Bass special Frosty the Snowman from the DVR…because not only do I want it to snow, I want the entire world to be animated. 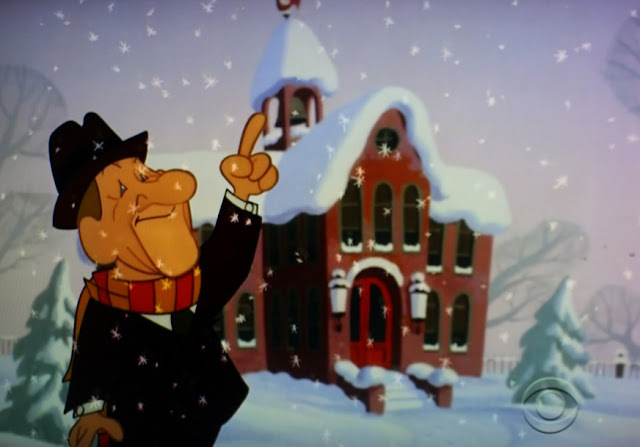 Based on a song popularized by Gene Autry in 1950, the same cowboy singer who introduced us to Rudolph the Red-Nosed Reindeer and wrote Here Comes Santa Claus, the special tells the story of a magic hat that makes a snowman come briefly to life. Rankin-Bass released this cartoon adaptation of the song in 1969. Narrated (and sung) by Jimmy Durante, with comedian Jackie Vernon voicing Frosty, the story Christmases up the original not-really-Christmas song with Santa and decorations and such. It also gives the story a villain besides the snow-unfriendly sun. An evil, bumbling magician, to be specific. Maybe it was the two glasses of rum and Coke Zero that I’d ingested prior to watching it (plus the one I gradually drained over the course of it), but instead of cheering me out of my snowless funk, Frosty really started bumming me out. 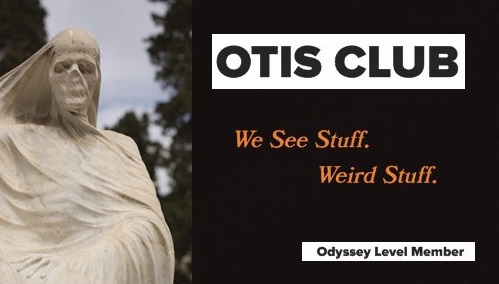 Even though I’ve seen him leading kids down the streets of town like 30 times, I suddenly started seeing that bipedal bit of white space as a metaphor for all that’s existentially atrocious about the human condition. Everything turns into a metaphor when I’m tipsy. I mean, just like most childhoods, his first breaths of consciousness were full of enthusiasm, happiness, and wonder. And then, ten minutes later, everything turned to absolute peril when he realized that the world was an inhospitable place for such as him. Seriously, it was mere seconds and a bit of song refrain between “I am alive! What a neat thing to happen.” To “Uh-oh. Is there a thermometer around here?” It’s like the whole thought arc of the plummeting whale in Douglas Adams’ The Hitchhiker’s Guide to the Galaxy. Eventually he did die. Death by greenhouse, in fact. A Sad little puddle reflecting the fiery red, poisonous chrysanthemums that surrounding him like blindly leering Triffids and mingling with the tiny tears of the little girl who loved him most. 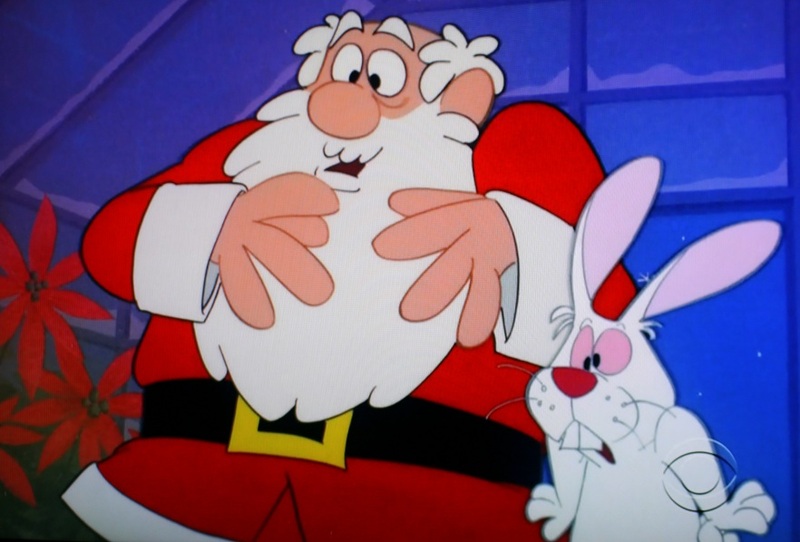 Of course, Santa Claus (who, as you know, speaks a fluent rabbit) saves the day and resurrects Frosty with a mere finger laid aside his nose (so to speak). And that, kids, is why some say we’ve made up God. Because life is short and wretched, and evil magicians want to steal our silk hat souls. In fact, in the original song, it’s even worse. There is no deus ex machina in a red suit and white beard. “Hurry on his way” is the euphemism used there for the end of Frosty, along with a vague eternal-lify promise of being back some day. The film dabbles with the whole problem of evil, as well, believe it or not (I mean, at least after three RC0s, it seems to). Professor Hinkle, the evil magician, didn't want Frosty to exist in the first place, and spent the whole movie trying to off him...just as much as the warm weather. However, had the magician not locked Frosty into the greenhouse to melt, Karen and Frosty might not have known of his eternal Christmas snow-ness after all. Thus, evil plays a part in God’s universal plan. 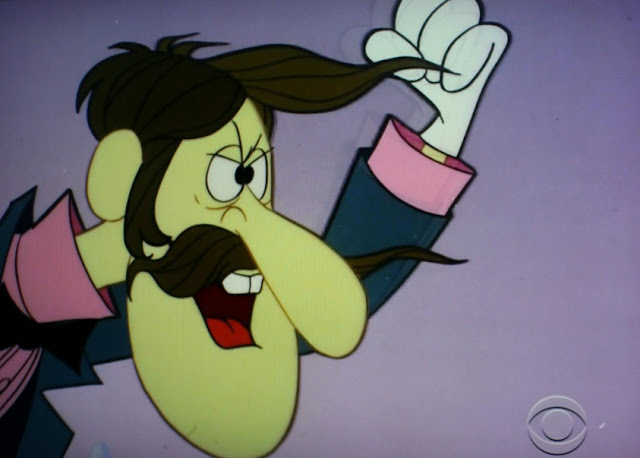 Or, in the words of Professor Hinkle, “We evil magicians have to make a living, too." 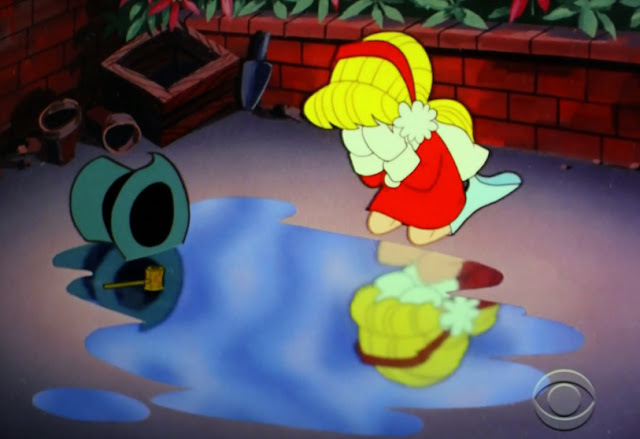 And just like that, Frosty becomes the saddest Christmas character of them all for me. Sure, Rudolph got made fun of, but that turned out OK. A prenatal Christ was rejected from every inn in town and had to start his short wretchedness in an animal trough, but he turned out OK, too. Minus the crucifixion bit. Frosty didn’t get a better life. He just was allowed the bare minimum. He was allowed to live…sort of. The way he talked about the North Pole, it could easily have been his version of heaven. It's a place where all his worldly problems are supposed to be solved, after all. So the Santa God-figure appears to take Frosty to the heaven of the North Pole just so Karen and her friends don't have to face up to the fact that he might not have been more than frozen water, anyway. 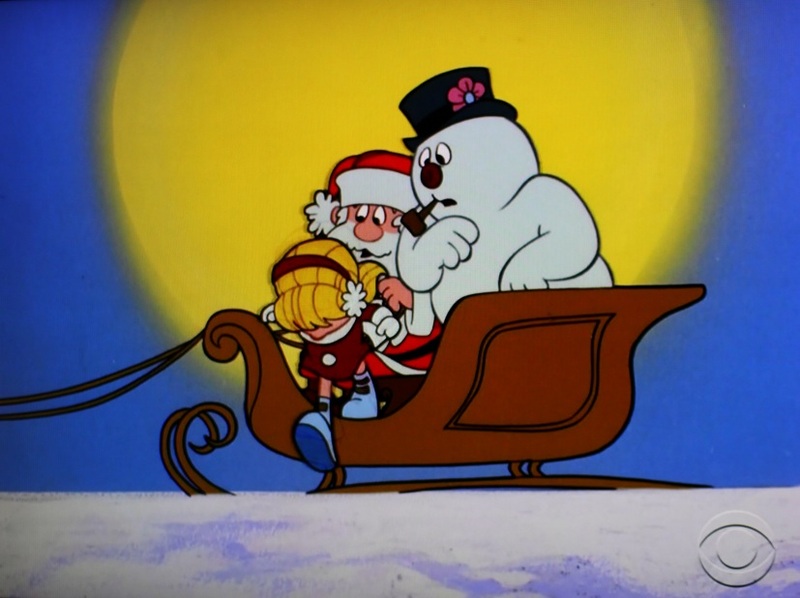 Sure, later in other specials Frosty gets married, has children, and befriends Rudolph, but that’s all apocryphal to the original story. That's how I felt at the end, too. Right, I know. I’m missing the moral of the story. 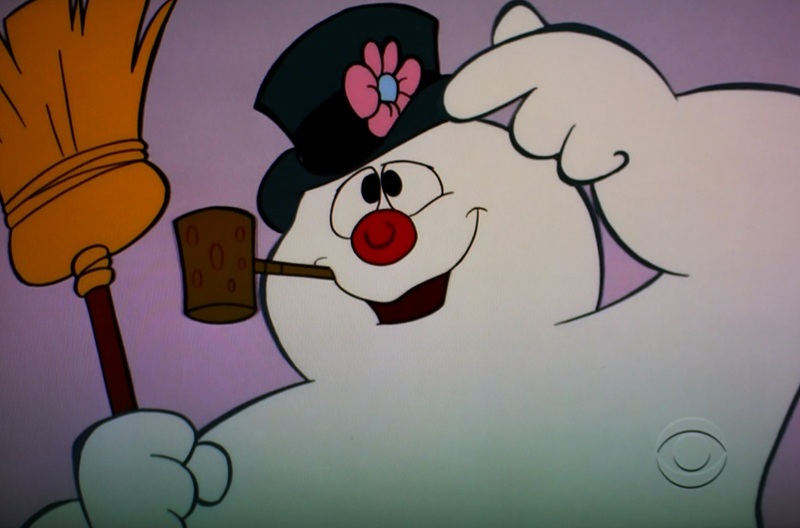 In this case, I guess despite the metaphysical turmoil on the part of Frosty, his response to it all was, “Let's run, and we'll have some fun before I melt away.” To me, though, the whole “enjoy life while you can” idea is salvage, not solution. Freefall is fun but not worth pancaking on the ground for. But you know what? There must have been some magic in that old Rankin-Bass special I watched. While it was playing, which was around 11 pm last night, it started to snow outside. A fine snow, with no hope of accumulation, but just enough to be able to change my mood. At least it would have ordinarily, if I hadn’t just interpreted all those floating, individually unique building blocks of Frosty as a representation of the misery of the human condition. Ha. What’s Christmas without a Scrooge. I need Emmet Otter. Stat.